Born in San Diego, California in 1952. He attended U.S.D. and specialized in Psychology and Sports (basketball). Since 1973 he has dedicated his life to learning, practicing and teaching different forms of Touch, Yoga, Meditation and Healing. His training and personal experience is deep and multidimensional. Before developing his own vision about Touch, he has and know and assimilated the work of many of the pioneers of body therapy. He spent twenty years in India, Thailand and Japan and has learn also the principles and the physics of Electro Magnetic Acupuncture, and Light Therapy, as well as Ayurvedic Philosophy and Touch in India, and Thai – Buddhist Massage in Thailand. He has the ability to get the best out of his students, helping them to trust their intuition and their inner wisdom. 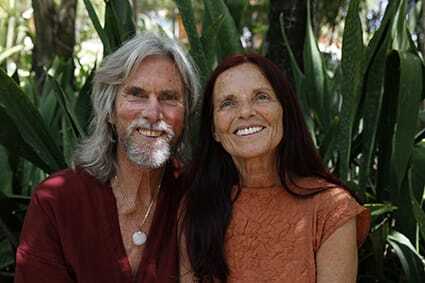 Many of his friends and students over the last 20 years have become successful healers and teachers, in Europe, U.S., Asia and Australia. In 1988, after having trained more than 1500 people in Osho Rebalancing® and Cranio-Sacral Sensitivity he went through an intense nine month process of personal transformation. During this time he gave 150 individual sessions to the Enlighten Mystic Osho and had the opportunity to ask various questions about the body, energy, healing and meditation. It is this time when Anubuddha experienced the essence of meditation, consciousness, love and the body as an organic unity. From this experience ARUN was born. Born in France (1951) started her discovery of herself through the body in 1973, and for a period of 10 years, she was putting all her energy into this journey by taking classes, courses, and giving and receiving many sessions; The main focus of all these methods is being aware: through touch, breath, energy and movement. Her teaching is an attempt to bring you in the moment, not wanting to change but more to accept this beautiful person that you are. She is trained in breath awareness, psychic massage, energy balancing, Aurasoma, massage and conscious touch. For many years she lived and work in Osho’s Communes and Meditation Centers in India, USA, and Europe. Since 1985 she and Anubuddha have been creating ARUN Conscious Touch. Her sessions are a synthesis of all these methods that she applies following her intuition with each individual, and a sharing of the deep love and relaxation that she has found through becoming friendly with her own body. Since the creation of ARUN in 1994, Anubuddha and Anasha have trained more than 600 people in Japan, Greece and Spain in the levels Basic and Advanced.